I was so happy that Catherine Hamilton, a lovely person and a brilliant artist, came to visit me in December. We had fun birding around the Albuquerque area. 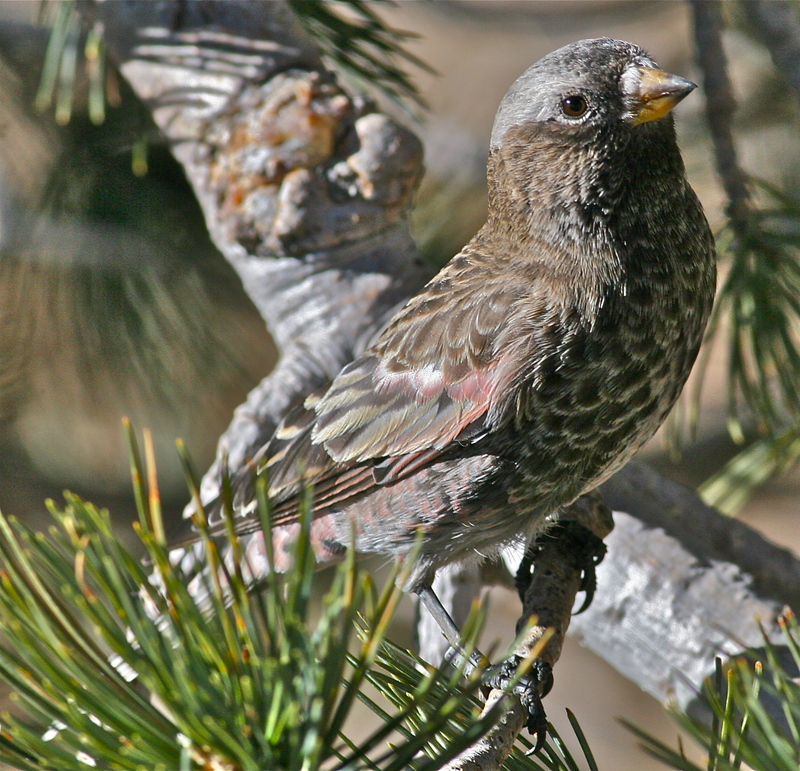 One of the “must-do” items on Catherine’s agenda was Rosy Finch banding at Sandia Crest. Catherine, Bosque Bill and I set off early on a cold Sunday morning hoping that the Rosy Finches would appear in significant numbers. 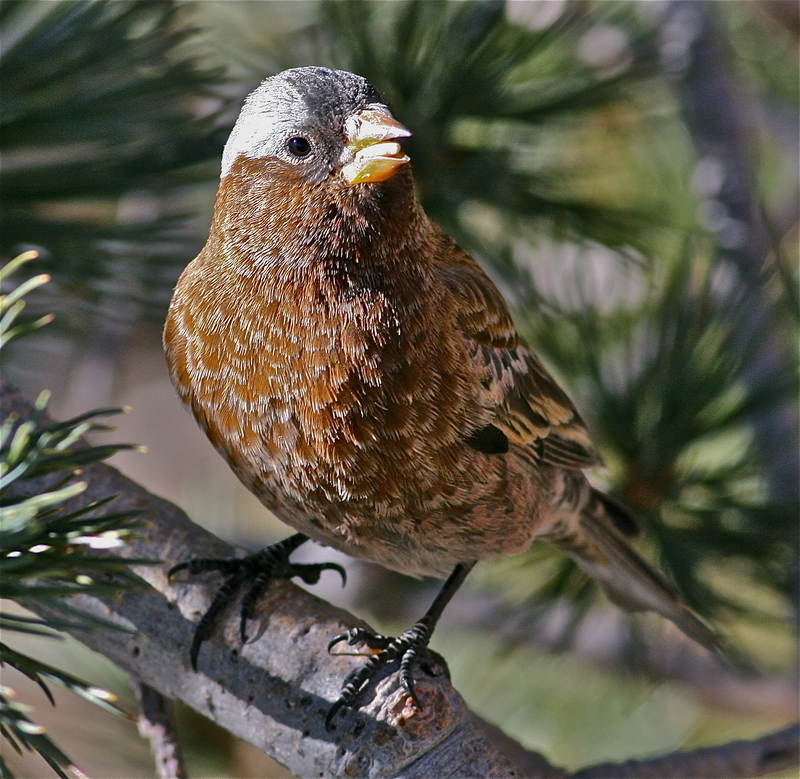 It has not been a good snow year in the Sandias, and the Rosy Finches often do not come to the Crest House in large numbers if their other food sources are not covered with snow. 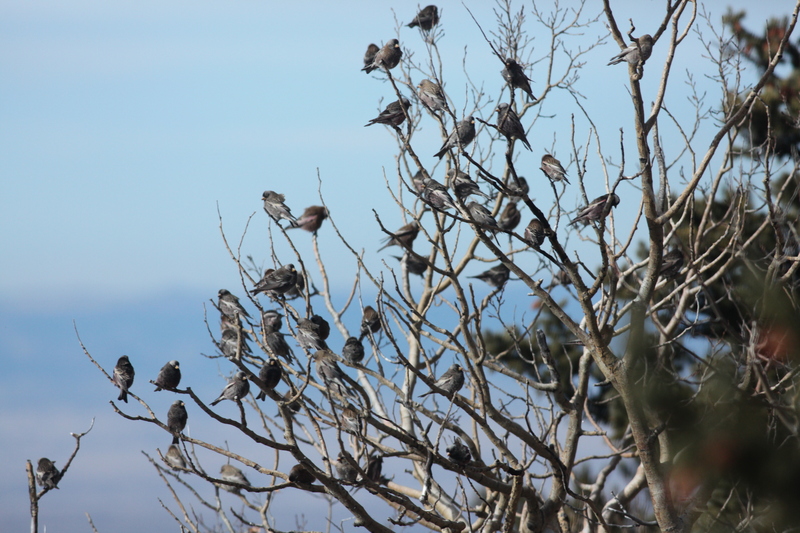 However, when we drove into the parking lot at 9:00 a.m., the first thing that we saw was a huge flock of over 100 Rosy Finches circling the Crest House. Catherine jumped out and got all three species and a Steller’s Jay before Bill and I even managed to get our camera equipment together. The pressure was off, and we knew it was going to be an excellent day. We went inside the Crest House to watch the birds and the banding. 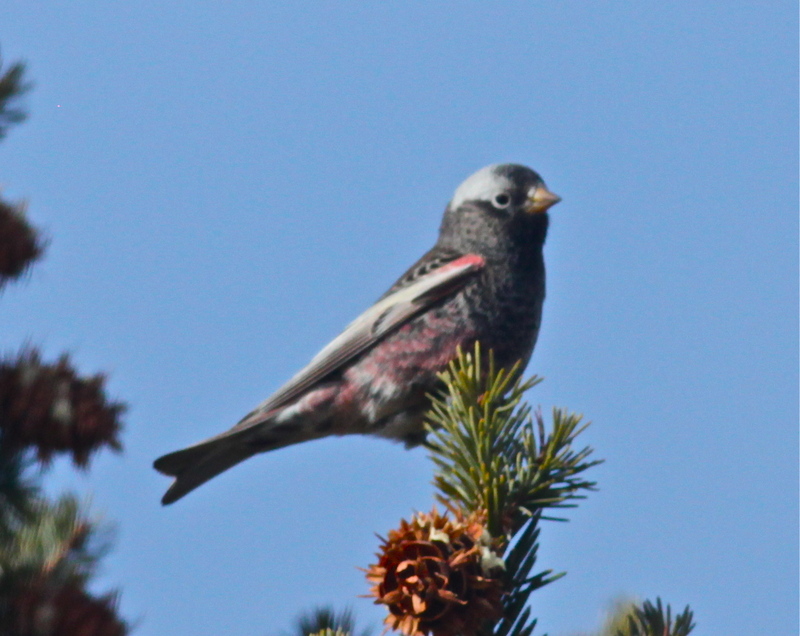 Rosy Finches were flying in from everywhere. The trees were full of them. 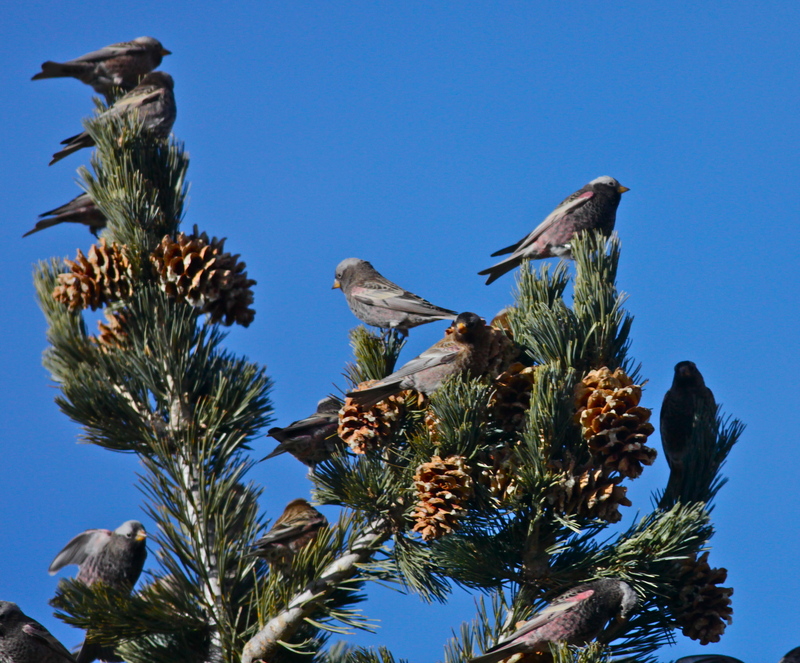 Rosy Finches in a piñon by the deck at the Crest House. 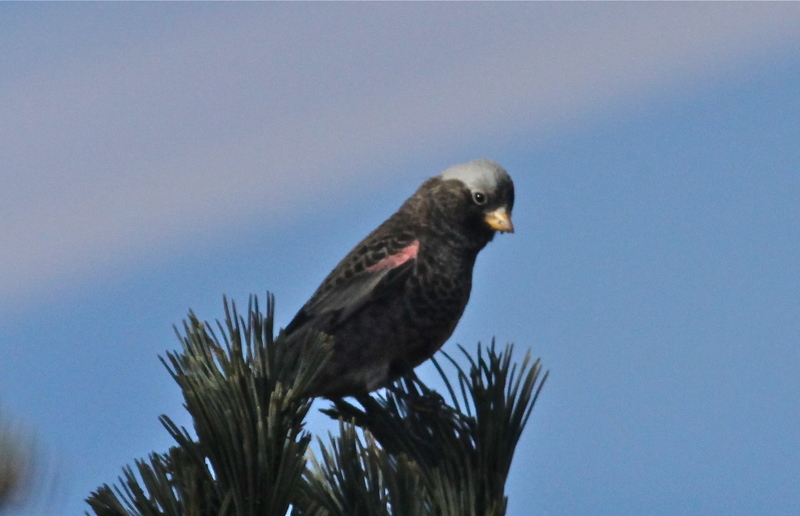 Even the trees below the deck were covered with Rosy Finches. 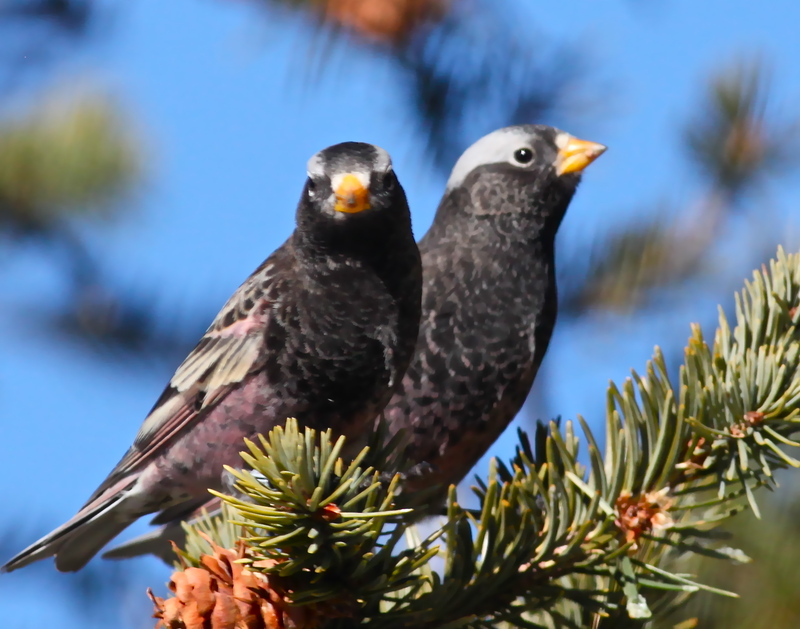 Rosy Finches wait in the trees below the deck at the Crest House. A Black Rosy-Finch studies the goodies on the deck at the Crest House. 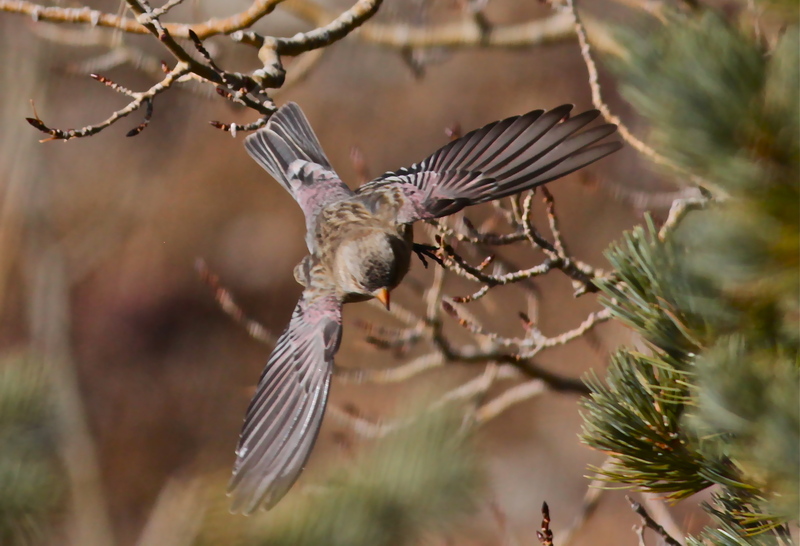 A Gray-crowned Rosy Finch flies towards the deck. 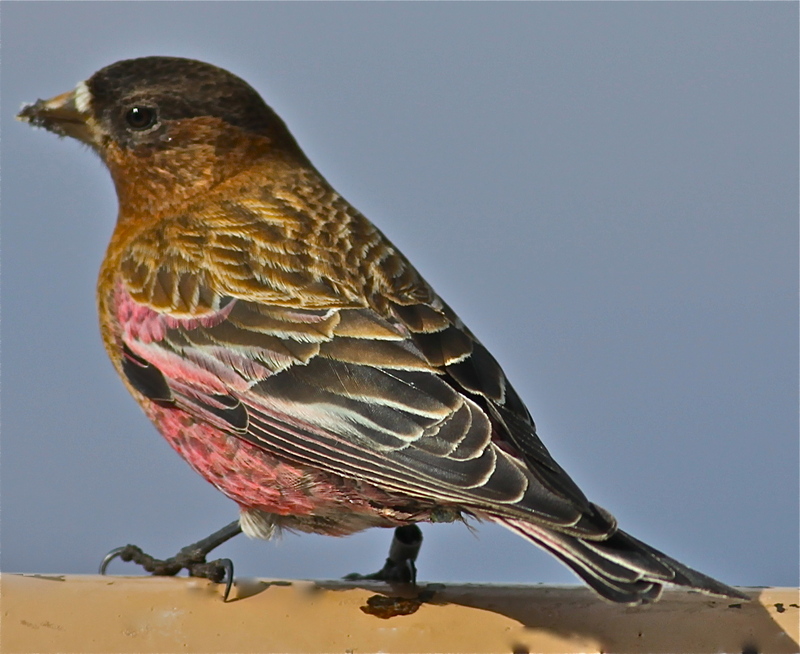 There are three Rosy Finch traps. The birds approach very enthusiastically. 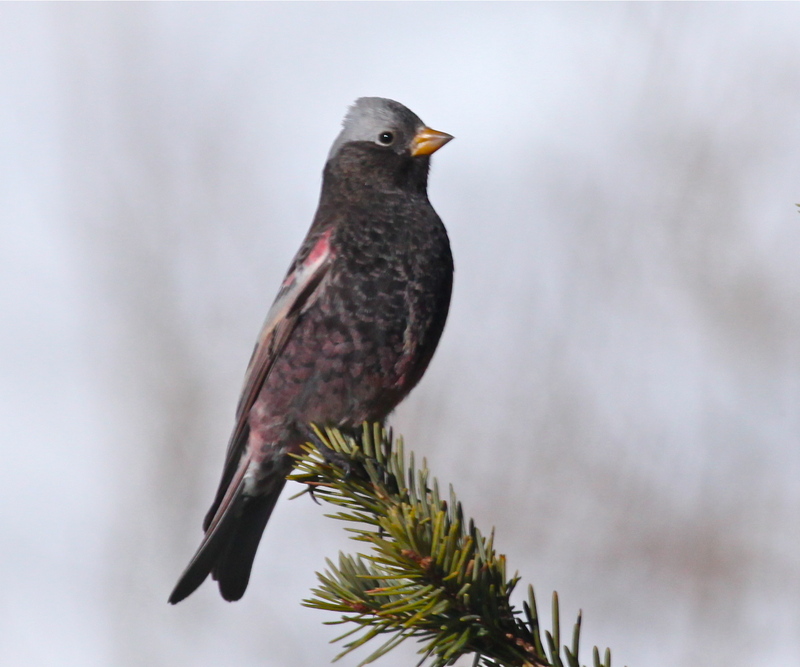 Rosy Finches fly to the trap. 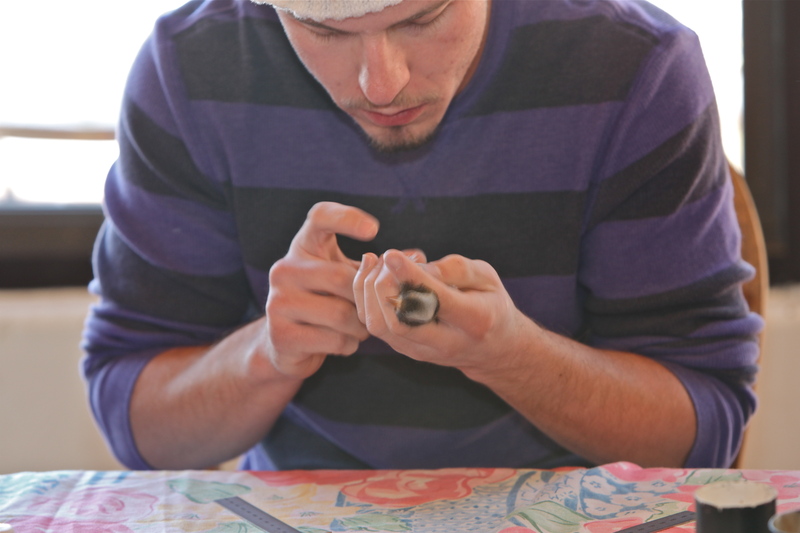 Banding a captured Hepburn's Gray-crowned Rosy-Finch. 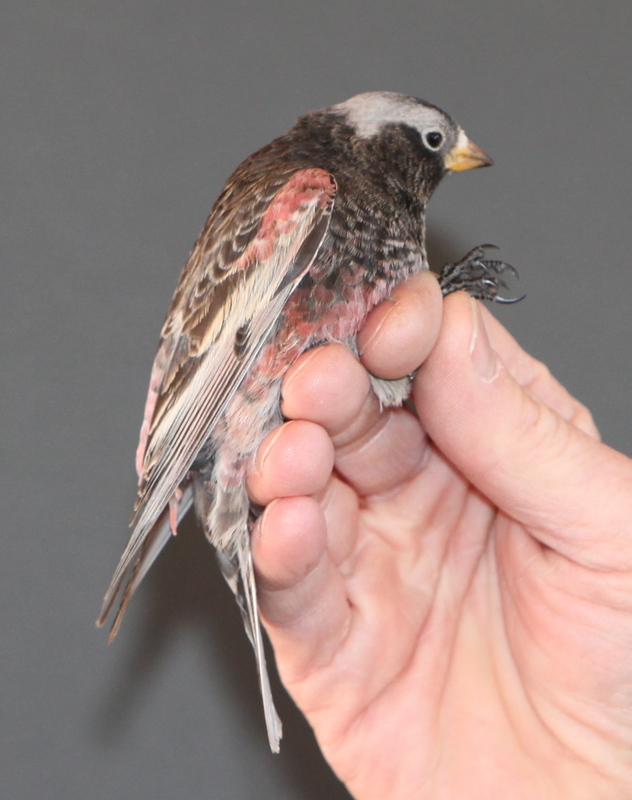 Hepburn's Gray-crowned Rosy Finch wing stretch. 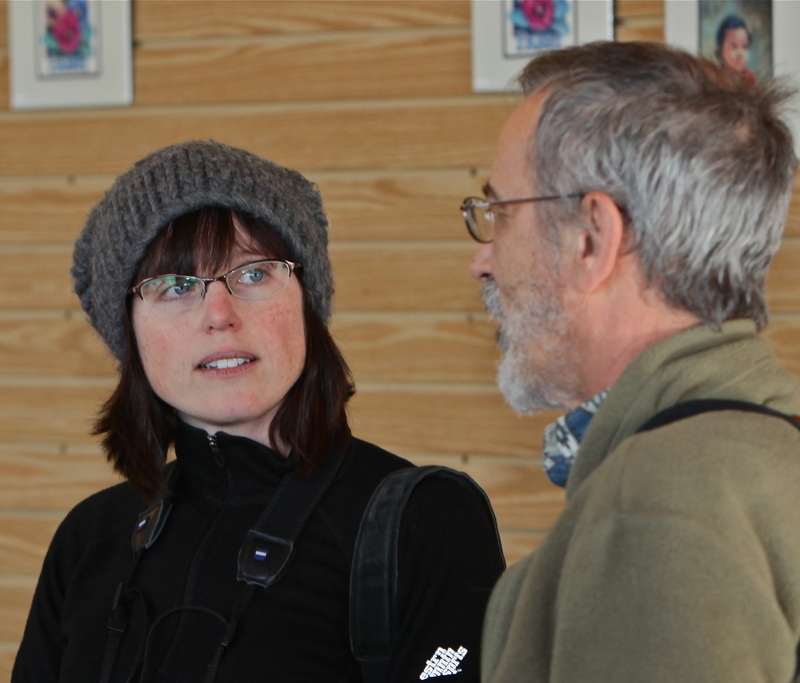 Catherine Hamilton a/k/a @birdspot discusses the finer points of Rosy Finch identification with another birder. 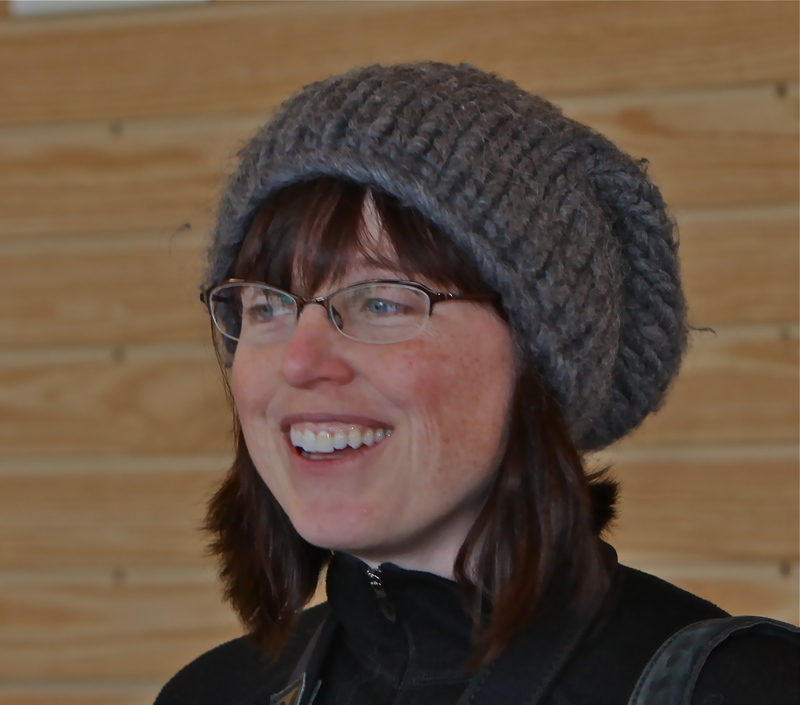 Catherine really enjoyed watching the bird banding. 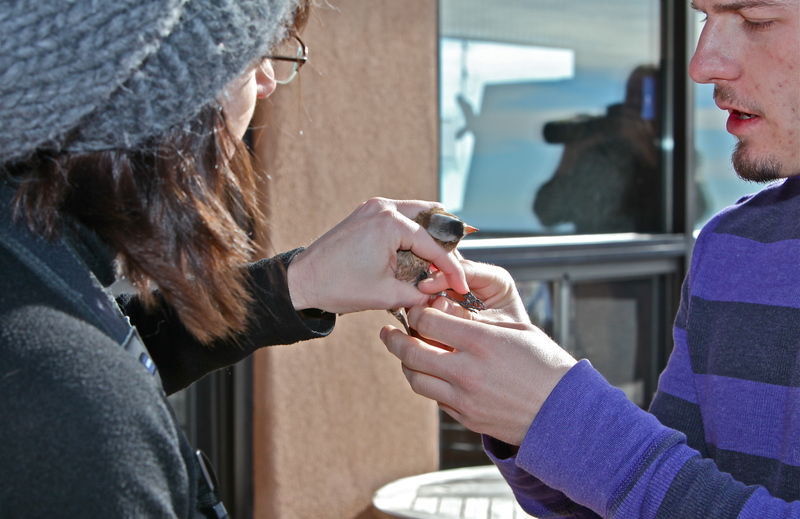 Being there when the Rosy Finches are banded allows people to get really close looks at them. 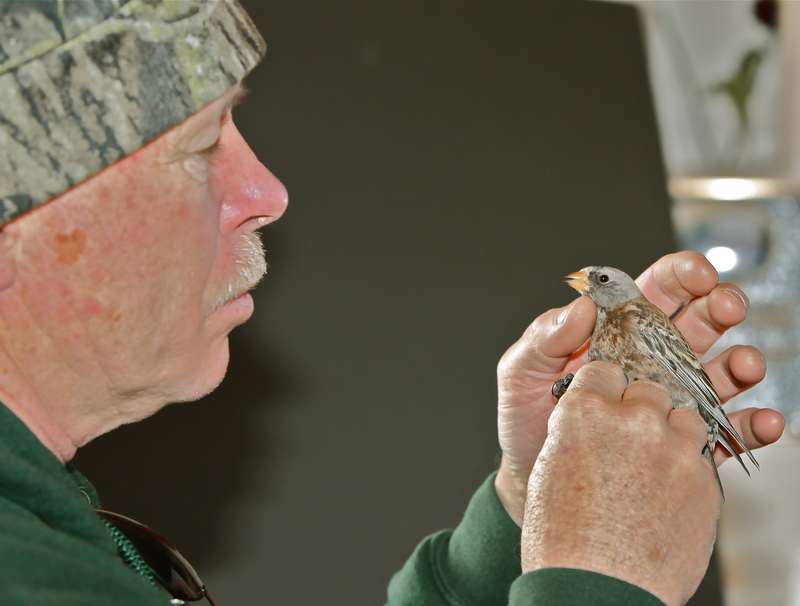 Terry Hodapp gets a Hepburn's Gray-crowned Rosy-Finch ready for photographs. 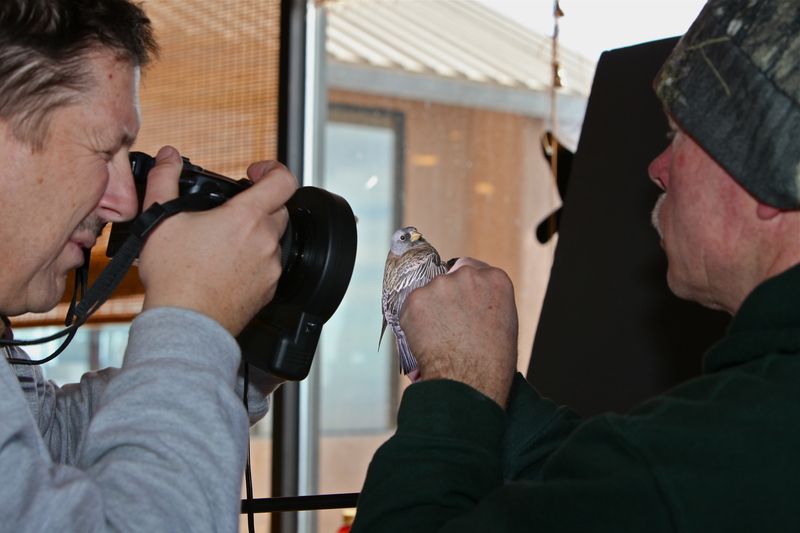 Terry Hodapp holds a Hepburn's Gray-crowned Rosy-Finch while Steve Fettig takes photographs. 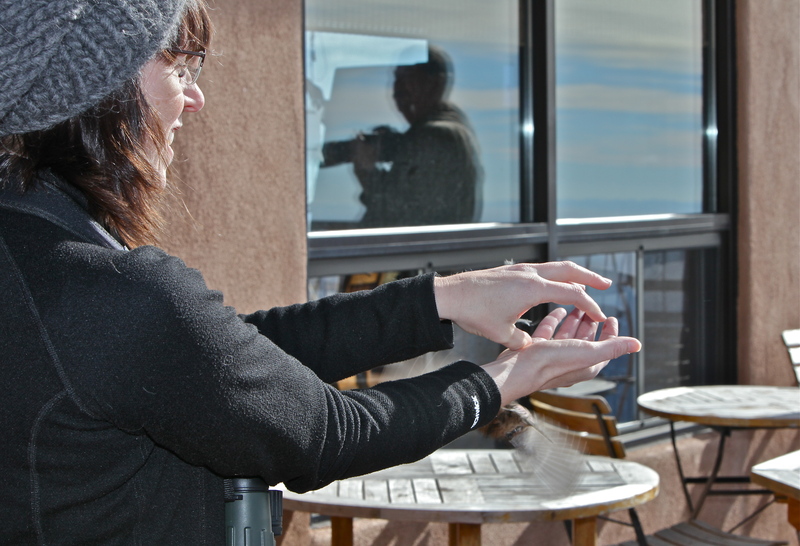 Terry holds a Black Rosy-Finch for Steve to photograph. 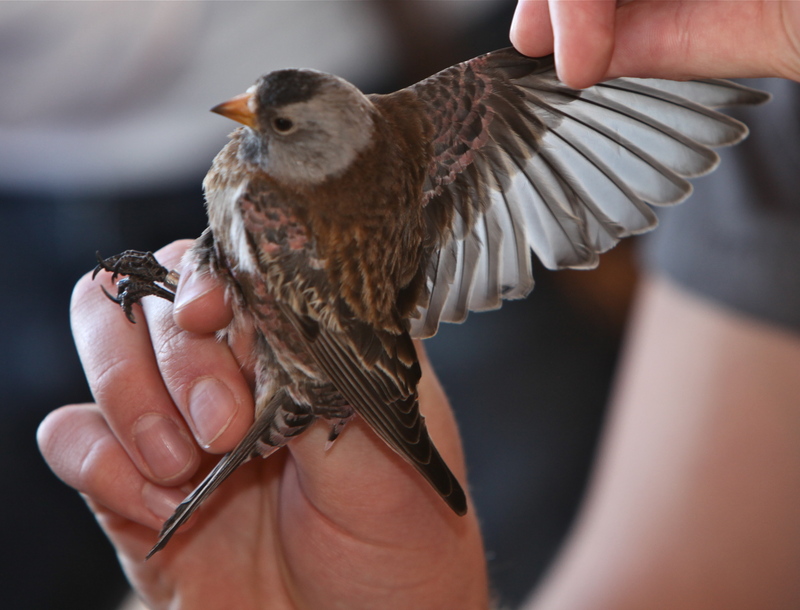 A highlight of the day was Catherine’s releasing a Hepburn’s Gray-crowned Rosy-Finch. We stayed at Sandia Crest for four hours. 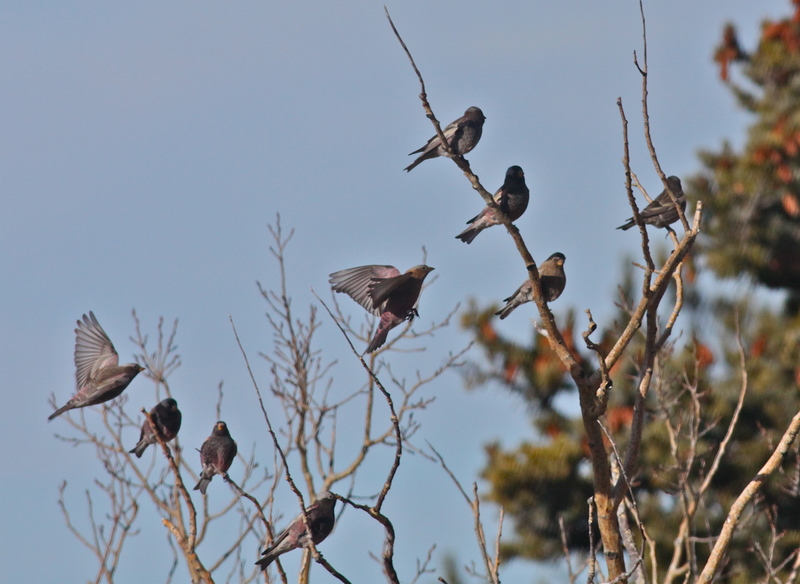 During that time the Rosy Finches continued to circle around and return to the deck. 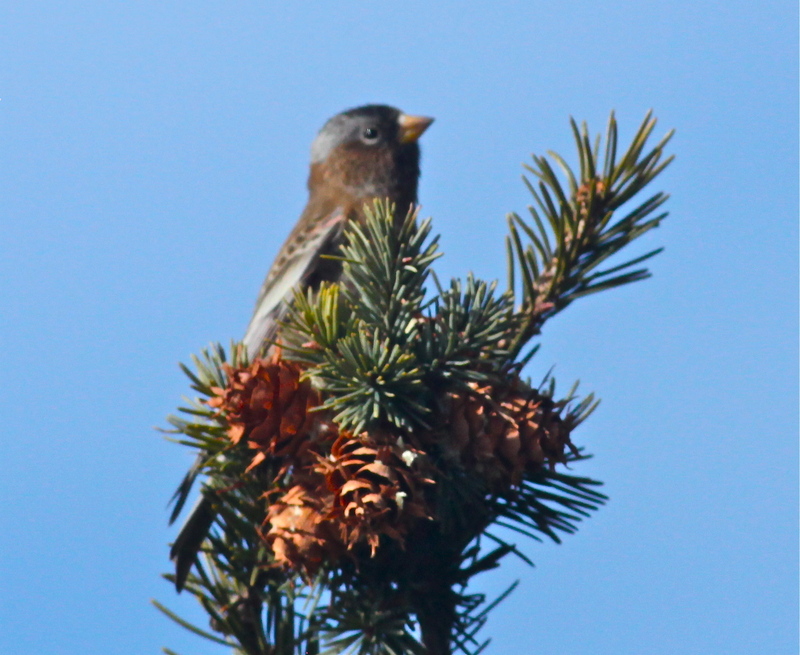 The trees were still full of finches when we left. 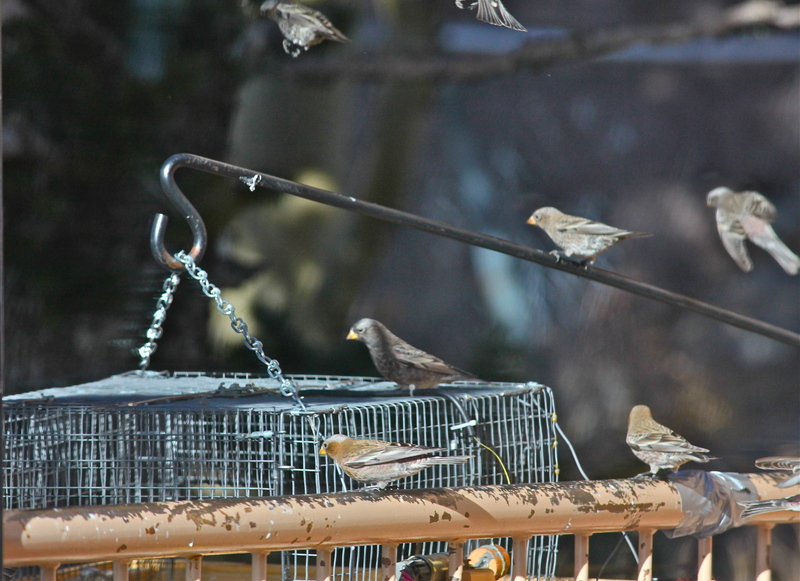 Here you can see all three species of Rosy-Finches: Gray-crowned Rosy Finches, Brown-capped Rosy-Finches, and Black Rosy Finches.